Allegedly, Glock USA is going to be releasing a new pistol soon, the rumor mill is buzzing between the G19X in black, a Gen5 Glock 19 MOS and/or one with front serrations, the Glock 46 (G46 9mm) I'll talk about that further down, and the rumors have been heavy on the G45 9mm, which is basically a 19x with front serrations, in black and with a bunch of Gen5 features. Why is this a super smart move by Glock? Because they are awesome at making people buy their new stuff and not releasing a new Glock that people actually want, but first releasing one which people will buy in palettes before moving on to one which people actually want. So what the market really wants right now is an MOS Gen5 Glock 19. That will probably not come out for a while, unless they are faking us really well. 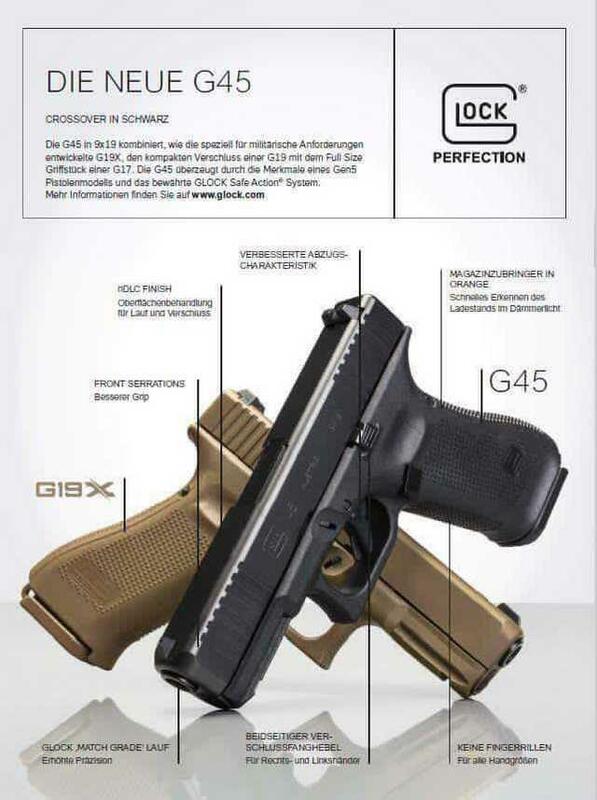 There are rumors that the new release will be the Glock 46 (G46 9mm) which is the German Glock 19 with a rotating (not tilting) barrel design which has been around since before the Beretta PX4 came out. Apparently it really helps accuracy, which would be an amazing addition to the Gen5 category of pistol since it is already super accurate and a rotating barreled Glock 19 sized pistol would break the internet pretty quickly. I would buy one to compare the gen3/4/5/what this would be considered in depth. More info on the G45 9mm -> here as a PDF <- It's in German though, but you'd probably be able to figure out the important stuff. As I hear things I'll post up.